On April 24, after the Ukrainian army resumed military operations in the Donetsk Region, five militiamen were killed and one police officer was wounded in the city of Slovyansk. Russian President Vladimir Putin labeled the actions as criminal and said that they would not go unanswered. Russian President Vladimir Putin warned that the actions of Ukrainian security forces in Slovyansk, which have already killed at least five local militiamen, would not remain without consequences. Earlier, the Russian leader said that Moscow could not abstain from intervening, if Ukraine continues to “violate the rights” of Russians. 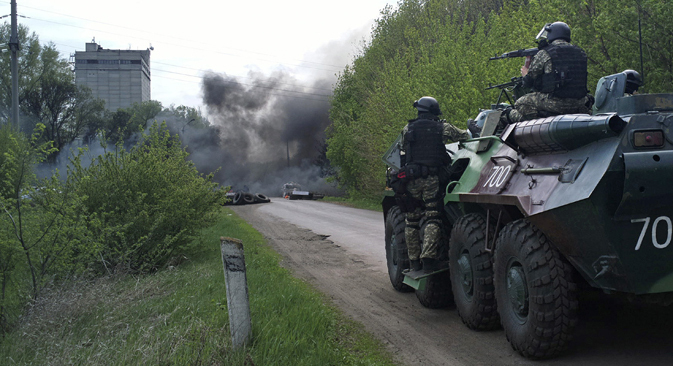 On April 22, following the discovery of two bodies near Slovyansk, including that of missing Horlivka city council deputy Vladimir Rybak, acting Ukrainian President Alexander Turchynov ordered the resumption of military operations against militias that had taken control of administrative buildings in the Donetsk Region. Two days later, on April 24, the Ukrainian army attempted to retake the city. After several clashes, five militiamen were killed and one police officer was wounded, before the attack was suspended. President Putin learned about the events in Slovyansk from the media and labeled the action by the Kiev authorities as criminal, reports RIA Novosti. “If, indeed, the current regime in Kiev starts using the army against the population in the country, this is, without doubt, a very serious crime against their own people,” said Putin, speaking at a media forum in St. Petersburg today‏. According to him, this will have grave implications for those who made such a decision. “If this is the case, these events will entail consequences for bilateral relations between Moscow and Kiev,” said Putin. “This is a junta,” the Russian leader said, reported ITAR-TASS. According to him, events taking place in Donetsk do not represent an acute phase of the conflict. “This is a punitive operation, which will have consequences for those people who make such decisions, including bilateral relations,” Putin noted. The Russian president believes that the Ukrainian authorities, in order to resolve the conflict, must not follow the path of legalization of radical organizations, but rather establish a dialogue within the country. “We took part in a meeting in Geneva, at which certain agreements were signed to the effect that both sides need to disarm people, liberate administrative buildings, and so on. “And what is happening now: No “Right Sector”, no other radical organizations have been disarmed, and no one in Kiev has been freed. On the contrary, they have begun to legalize these groups. And who is legalizing them? We must not go in this direction, but follow the path of dialogue among all the inhabitants of the country, wherever they live,” said the president of the Russian Federation. What are the options for de-escalation in Ukraine? Putin’s comments were consistent with statements he made earlier during his annual TV call-in show on April 17, in which he also accused Ukrainian authorities of criminal acts. “Instead of realizing that there is something wrong in the Ukrainian state, and making attempts to negotiate, they began to threaten the use of even more force, and reached the point of sending tanks and aircraft against the civilian population. This is another very serious crime committed by the rulers in Kiev today,” said Putin during the show. First published in Russian at Moskovsky Komsomolets.